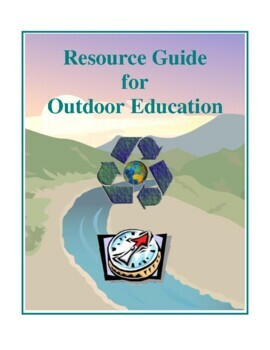 Outdoor Education Resource Guide helps teachers utilize the out-of-doors as an extended classroom where students learn in their immediate environment starting with activities that are familiar and relevant to them. 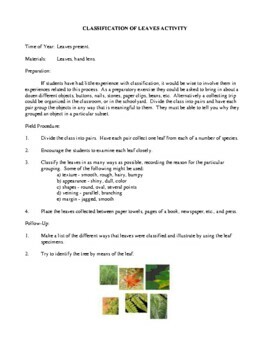 The outdoor activities in the guide are both practical and imaginative and cover most subject areas. 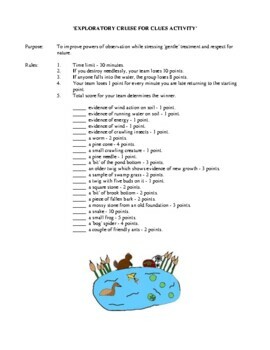 Along with a variety of activities, the guide provides many pointers, approaches, planning, and evaluation. 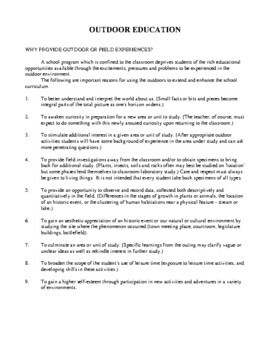 Outdoor Education Resource Guide topic and activity titles include: Why Provide Outdoor or Field Experiences?, Developing an Approach to Education Outdoors, A Recommended Code for Outdoor Studies, Seeing Is Believing, Observation Skills Activity, Exploratory Cruise for Clues Activity, Sensory Perception Activity, Texture Activity, Color Activity, Art Education and the Outdoor Environment, Education Through Use of the Schoolyard, A Square Meter Field Trip Activity, Activities Using Trees, Story of Two Trees Activity, Plaster Cast of Bark Activity, Classification of Leaves Activity, A Fact List for a Stump Activity, Study of a Rotten Log Activity, Weather Activity, Mini-Climates Activities, Wind and Birds Activity, Infiltration of Water in Various Soil Types Activity, The Ant Study Activity, Study of a Spring Activity, Snow Activities, How Clean is Snow Activity?, Melting Snow Activity, The Effect of Salt on Snow Activity, Two Easy Ways to Estimate Heights, Age of a Tree Activity, Outdoors in the Dark Activity, Cross-Country Skiing Activity, The Cemetery as a Community Resource, The Cemetery - 'A Journey Into the Past' Activity, The Outdoor Leader, Conducting a Hiking Trip, Leadership Organization, Evaluation, Evaluation Sheet Activity, Follow-Up, Food Planning for Campers and Hikers, Games and Contests for Outdoor Groups, A Field Trip Checklist.